Comments: Chips in places, minor cracks in the back, worn patina, tears in raffia textile, a few missing feathers This face mask belongs to the category of Pwoo Itok and Isheen Maal masks of the Kuba-Ngeende. It shows features very particular to this type f the masks: a protruding forehead decorated with a series of triangular patterns, cone eyes with protruding pupils, sometimes encrusted by a strip of copper. Multiple holes in the surrounding whites of the eyes evoke the chameleon which can see everywhere. The face has a large triangular nose and a prominent mouth. 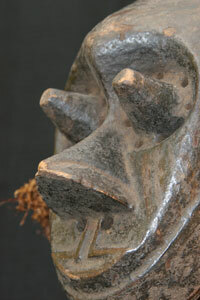 Usually, the face is extended upward by a headdress made out of reeds and raffia fiber, or horns. Pwoo Itok and Isheen Maal (also called Pwoom Itok and ishyeenmaal or Shene Malula)This type of mask is found among the Kuba-Bushoong, the Shoowa, and the Ngeende peoples. According to some sources, Isheen Maal was inspired by Pwoo Itok. In any case, the difference between the two is hard to detect and in the literature they are seen as the same mask, with different names depending on where the mask was found. Most likely the Shoowa use the Pwoo Itok while the Kuba prefer the term Isheen Maal. The origin is unknown.Such masks were used as a dancing mask during the initiation of young men and among the Bushoong it was worn by members of the Batende, a secret regulatory society which had among its duties the apprehension of criminals. The Ngeende group claims to be descended from Ishweemy, one of the nine sons of Woot, the primordial founder of the Kuba Kingdom. Accordingly, the Ngeende are of special importance to the Kuba Kingdom and designated as the holders of the Kuba official charms, Muyum. They share not only a common history but also the same culture and traditions as the Kuba. Even today, they still send representatives to the Kuba-Bushoong court. The Ngeende live in small villages led by chiefs who rule with the council of elders. Understandably, their art has many congruities with the art of the Kuba-Bushoong, the Ngoongo, the Kete, and all of them produce masks. 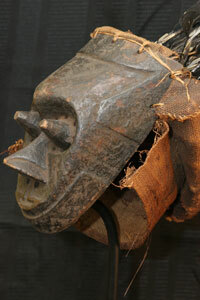 It is said that some Kuba masks such as this have been made by the Ngeende. 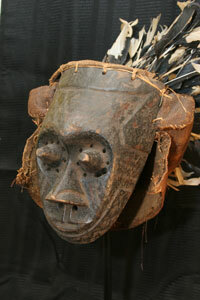 The Ngeende masks tell the story of Woot and other important characters in the foundation of Kuba kingdom. These include Bongo (Mbwoom), Mukenge which is a variant of Moshambooy, Shala-Mushampoji, and another variant of Moshambooy without the elephant trunk, Ishendemala with goggle eyes, and Nyibita with a very elongated face. 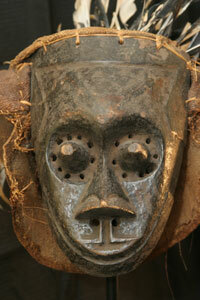 These masks were used at the funerals of notabilities and at initiation ceremonies.